Advantages: Knowledgeable contributors, superb artwork, 1/72 and 1/48 scale general arrangement drawings, A4 format well suited for image reproduction. This is the second issue of Windsock Worldwide magazine that I have read, and it easily lives up to the standard set by the first. I am a serious fan of anything that reflects the personality of the person who created it and this magazine lives and breathes it's editors passion for the subject. Personally I find it difficult to maintain a high level of interest for a subject after prolonged exposure to it, but fortunately Ray Rimmel still possesses a passion for WWI history that benefits the relatively uninitiated like myself. This issue keeps things very current and starts of with some fantastic detail shots inside the front cover that will be of immense use to anyone who has purchased the newly released Nieuport 11 from Special Hobby. The information on the Nieuprt "Bebe" continues inside with a beautifully illustrated centre spread by Ronny Bar along with the first part of a fabric special from Alan D Toelle covering the Nieuport Camouflage of 1916. Well researched and thorough in it's examination, this article will be very useful to modellers. Also beginning in this issue is a chronicling of RE8 Squadrons 1914-1918 covering Les Rogers visit to the front. Another extremely interesting article loaded with photographs that will aid anyone making the 48th Aeroclub kit or the old Airfix kit in 1/72. As I mentioned earlier I am relatively new to this WWI modelling lark, and the amount of aircraft types amazes me, particularly the lesser known combatants contributions. The ongoing series contributed by George Haddow sees the Hansa Brandenburg W18 featured, and thanks to some scale drawings, colour profiles and plenty of superb photographs, the type is thoroughly covered. There is an interesting article on 1/144 scale modelling for a wargame although this is the only "modelling" article to feature in this issue. There is the usual expert review of the latest products in WWI modelling covered, featuring several kits, books and resins from manufacturers all over the world. 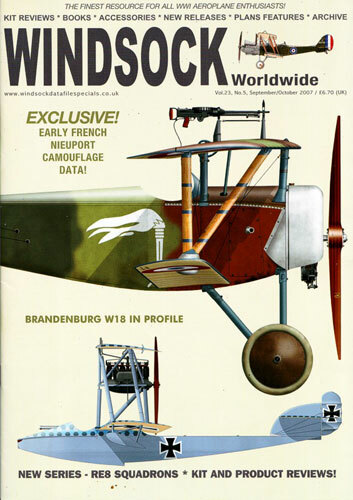 I rate Windsock Worldwide very highly as a magazine (in case you hadn't gathered that already) and as a WWI Modelling companion I would think it would be invaluable. This is a very specialist magazine and focuses far more intensely on the subject matter than any of the more generic overall coverage magazines would, and for me personally, I find it a fascinating read. Windsock Worldwide and Windsock datafiles are available through the Windsock Website.